FREE $10 Restaurant.com eGift Cards! 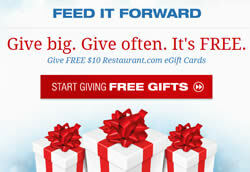 Create an account at Feed it Forward and you'll be able to send up to 40 $10 Restaurant.com eGift cards! No CC information is required!